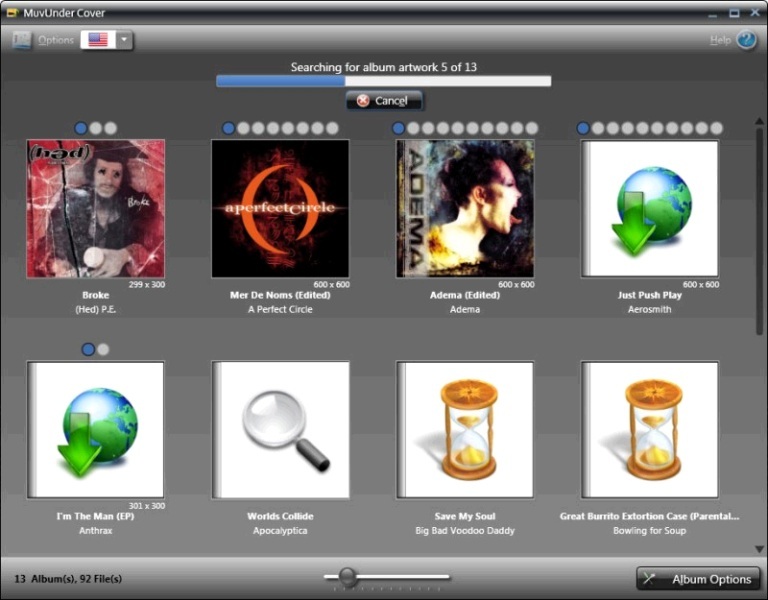 ...... You can move songs to another computer or to any portable device, and they will always have the album artwork with them. MuvUnder Cover: The Album Art Sleuth lets you find the perfect cover artwork for each album. Many Internet sources have album covers that have "parental advisory" labels or other stickers blocking parts of the cover artwork. MuvUnder Cover locates multiple images for each album and lets you choose your favorite cover with or without the stickers. Qweas is providing links to MuvUnder Cover: The Album Art Sleuth 1.7.0.0 as a courtesy, and makes no representations regarding MuvUnder Cover: The Album Art Sleuth or any other applications or any information related thereto. Any questions, complaints or claims regarding this application MuvUnder Cover: The Album Art Sleuth 1.7.0.0 must be directed to the appropriate software vendor. You may click the publisher link of MuvUnder Cover: The Album Art Sleuth on the top of this page to get more details about the vendor.